It's not often that I recommend a product that's super expensive. But when I do, you'd better believe I absolutely love it and have to share my love with the world. To that end, behold The Luxe List, where I bring you the most luxurious products on the market that are actually worth their salt. I am constantly on the lookout for hand creams that don't leave behind greasy residue. It's not as easy as it sounds! Luckily, the wonderfulness that is La Prairie Cellular Hand Cream recently came into my life. What makes this hand cream special is the combination of moisturizing and marine derived complexes. What does this mean? It works to shield, protect, balance and nourish the skin while encouraging gentle exfoliation, inhibiting water loss and combating premature aging. Sounds too good to be true, doesn't it? Well, I'm here to tell you that this cream works. Thanks to ingredients like Glycerin & Sodium PCA (humectants that provide moisturization), Marine Derived AHAs (to exfoliate the skin), Grape, Mulberry and Licorice Extracts (for skin brightening) and the always essential Shea Butter (to provide a protective barrier on the skin and enhance nutrition), my hands have never felt softer or smoother. And if there's anything more divine than the white tube with lacquered silver cap, I simply haven't found it. 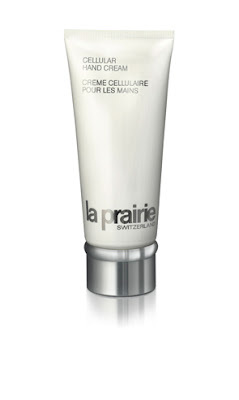 La Prairie Cellular Hand Cream retails for $95 at laprairie.com.